It’s HOLLYWOOD Night TONIGHT @ Two Chefs KATA CENTER!!! Tonight is the night you’ve all be waiting for!!! It’s Hollywood Night at Two Chefs Kata Center! 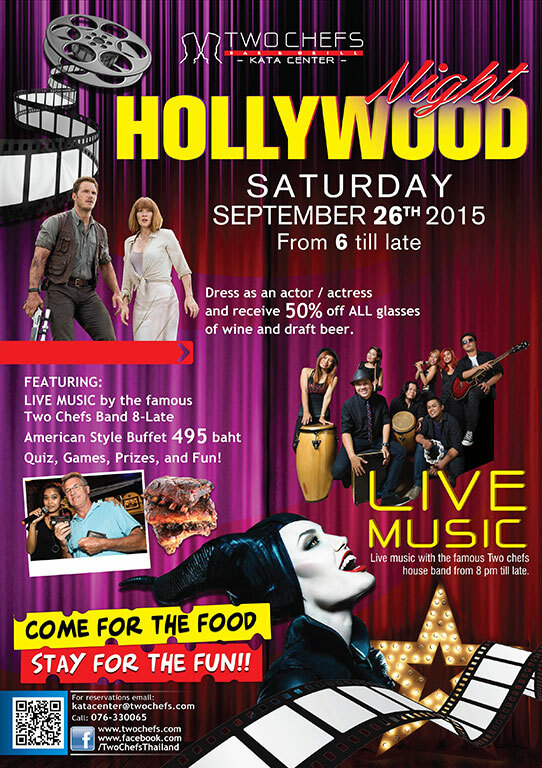 Don’t miss it tonight September 26th 2015 from 6 till late! Enjoy live music? We have it! Enjoy a perfectly blended cocktail? We that too! Looking for an ALL YOU CAN EAT BBQ? Well, we have that too!! Feel like dressing up? DRESS as an ACTOR/ACTRESS and RECEIVE 50% OFF of ALL glasses of wine and draft beer! Last Chance To BOOK NOW at https://bit.ly/TwoChefsReservations for 20% OFF ALL Menu Items!